Chukwuka Cosmas Ezenma-CBSS research grant for African students in space science and astronomy offers grants in favor of African students and researchers including Nigerians in order to develop capacity in space science and technology, Electronics Engineering, Astronomy and Astrophysics, foster international, cultural, scientific and technological cooperation in Africa. 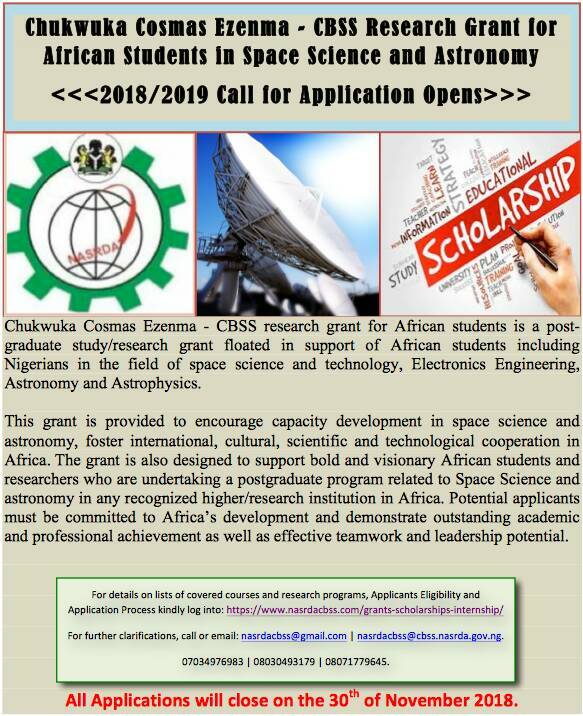 The grant is designed to support bold and visionary African students and researchers who are undertaking a postgraduate program related to space science, technology and astronomy. The scholarships are open to applicants in the following field of space science and Astronomy; Environmental Science, Satellite Communication, Remote-Sensing, Atmospheric Sciences, Astronomy and Astrophysics, Instrumentation/Electronics/ICT, Geodesy and Geo-dynamics. Space Applications, Space Science and Technology, Rocketry, Space Science Education, Transport and Propulsion. Up to 10 scholarships/research grants may be awarded annually for African Students residing in Africa. All of the awards are aimed at African students with high academic ability (typically with a good first degree at least second-class honors upper division or it’s international equivalent). Please note that applications will only be considered from candidates already holding an offer (either conditional or unconditional) from a University/Research Institution, who are classified as an African student for fee purposes. Preference will be given to female applicants and physically challenged applicants. – be enrolled or accepted for enrollment as a regular student in eligible post-graduate degree in any African public university or research institute. For further clarifications, call or email: nasrdacbss@gmail.com | nasrdacbss@cbss.nasrda.gov.ng. 07034976983 | 08030493179 | 08071779645.